Nobody likes a bully and when victims of bullying fights back better be prepared as they will definitely kick the sh*t out of you. This video of a bully has gone viral … when a menace picks a fight with the wrong kid and instantly regrets it. 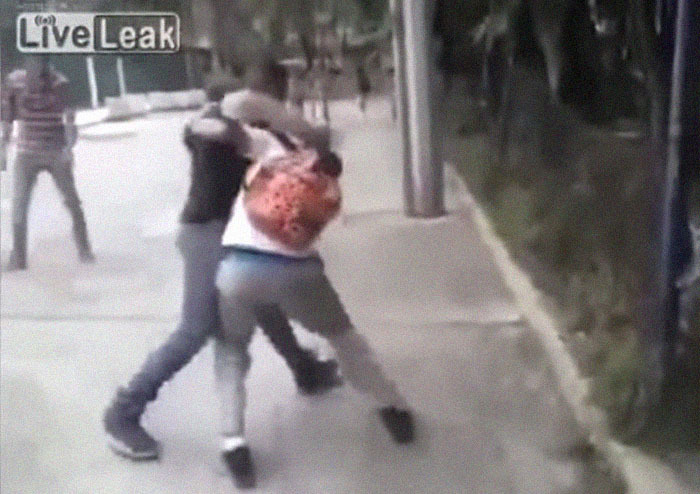 The footage filmed in Indonesia, shows a young teen walking on the street, when suddenly a bully attacked him without apparent reason. The bully harasses the teenager and throws some powerful-looking elbows at him. However, the victim though smaller than the bully, seems stronger than he looks and fights back. The two wrestle and fall to the ground but the crowd separate them to have a descent fight. After exchanging some powerful blows, the bully ends up on the ground. The supposed to be victim then smashes his opponent with a powerful knee to the head. And instantly delivers his final blow – a devastating kick to the face! Leaving the bully knocked out cold, sleep tight kiddo.